What Day Of The Week Is June 6? 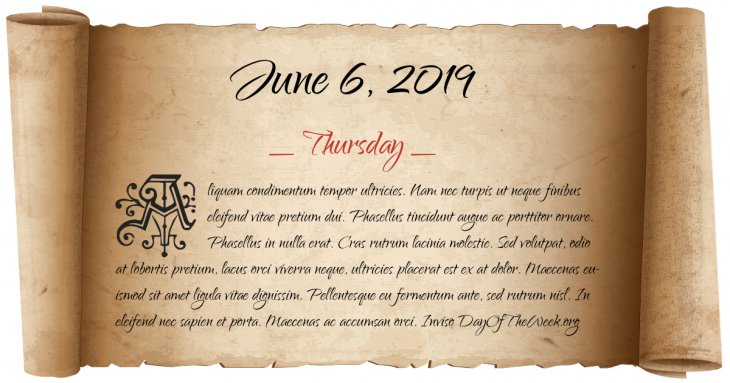 June 6, 2019 is the 157th day of the year 2019 in the Gregorian calendar. There are 208 days remaining until the end of the year. The day of the week is Thursday. The Qing Dynasty Manchu forces led by the Shunzhi Emperor capture Beijing during the collapse of the Ming Dynasty. The Manchus would rule China until 1912 when the Republic of China is established. The Ashmolean Museum in Oxford, England, opens as the world’s first university museum. Australia: Queensland is established as a separate colony from New South Wales (Queensland Day). The Shewan forces of Menelik II of Ethiopia defeat the Gojjame army in the Battle of Embabo. The Shewans capture Negus Tekle Haymanot of Gojjam, and their victory leads to a Shewan hegemony over the territories south of the Abay River. The eruption of Novarupta in Alaska begins. It is the second largest volcanic eruption of the 20th century. Judge Joseph Force Crater, known as the “Missingest Man in New York”, is declared legally dead. The National Basketball Association is created, with eleven original teams. Soyuz program: Soyuz 11 launches. Who were born on June 6?